Windows Phone 8 is slowly gaining ground on the far more established Android and iOS ecosystems. The latest news puts it at 9.2% of the top five European markets, and at 12% in Great Britain. 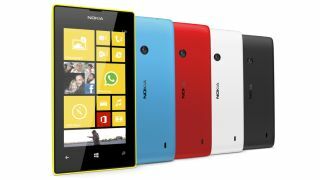 The influx of high end devices such as the 41MP camera wielding Nokia Lumia 1020, the mid range Nokia Lumia 625 and the low end low price Lumia 520, as well as likes of the 8X from HTC have helped establish Windows Phone as the third OS of choice. Windows Phone comes with your standard array of inbuilt apps, but we're not going to be discussing these in detail here. Of these the most obvious has to be the SMS app. As we've all come to expect, it comes with the ability to send both text and multimedia messages. Emails can also be sent and received using the pre-installed Windows Email app. Whilst Android and iOS come with the ability to send messages across Facebook and Twitter through dedicated apps, Windows Phone comes with these built in. This makes life slightly easier, saving you the need to pop off to the Windows Store. Overall, we have found that because the Windows Phone OS is relatively new, the Windows Phone store doesn't come as well populated as the App Store or the Play Store. Whilst there are a lot of cross OS apps available on Windows devices, these are often not as well feature packed, and there are some notable omissions, such as SnapChat. We'd bet a large amount of money that anybody interested in using differing messaging services has, at the very least, heard of WhatsApp. Being one of the most popular apps around, and working across multiple operating systems, WhatsApp is a complete messaging app. WhatsApp is not a totally free app, although most users won't baulk at the price of 69p a year, with the first year being completely free. Being highly popular as it works with your existing mobile number, and not a separate username or pin, it makes connecting to your friends very easy. The sending of pictures, audio messages and video clips is also supported, and as they are all sent via the web (mobile or Wi-Fi), there is no need to worry about them eating into your SMS or MMS allowance. If this just isn't quite for you, we could, and will, suggest using ChatON. Now being a cross OS app, ChatON features 70 million users, as well as the ability to connect 5 devices to your account. As a communication app, there are few that match Viber as a complete app. It is available across multiple platforms, complete with 175 million users and no advertising. Viber is a VoIP service, that provides calling across the web so that it doesn't use up your bundled minutes. It also allows the sending of text and photo messages, in both one on one chats as well as groups of up to 16 people. Like WhatsApp, your phone number is your user ID so there is no need to mess around with usernames or passwords, and Viber automatically detects which of your contacts already have the app installed. For those that think that Viber is too hot, too cold or just not right, why not try Line. With 160 million users worldwide, Line also makes calls, sends messages and stickers, as well as being available across multiple OS'. Another cross OS app ideal for messaging is Nimbuzz. Connecting to other Nimbuzz users, as well as to Google's and Facebook's messaging service, Nimbuzz has 150 million users. Custom status', photos and text messages are sent via the mobile web or Wi-Fi, rather than through your minutes or texts package, saving you a little bit of money which is always handy.